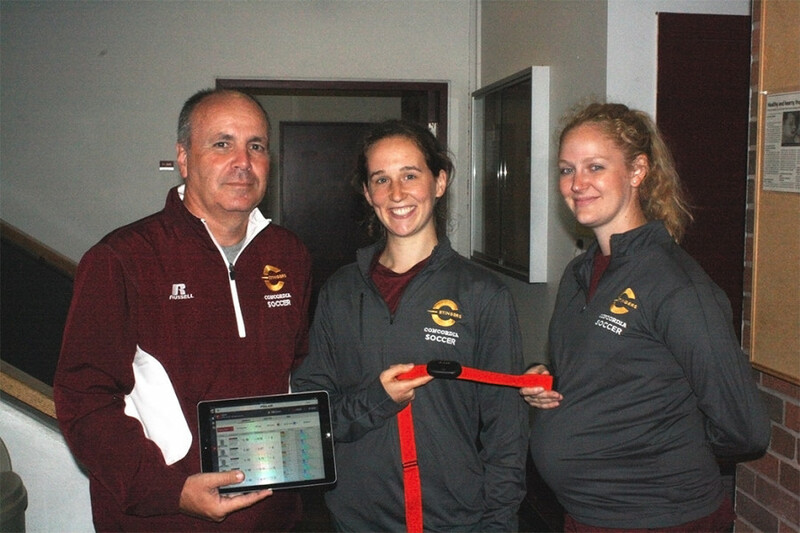 As part of a pilot project, the women’s soccer team began a process to bring sports science to the Stingers for training and in-game situations. With this goal in mind, the athletics department purchased ten chips made by the company Polar for the team to use in practice and during games. The new technology is a little chip attached to a strap tied over the heart. The chip calculates the player’s heart rate, kilometres ran, the number of sprints made and running accuracy through a heat map. All of this data goes from the chip to a satellite and right back to the coaching staff’s iPad in real time. This kind of technology was first introduced through the men’s soccer team and its head coach Greg Sutton, but it only monitored heart rates. It was due to budgetary reasons that the women’s team didn’t get similar technology as the men, according to Concordia Athletics Director Patrick Boivin. When the women’s soccer coach Jorge Sanchez first saw this, he wanted in on the project—except with bigger plans. “When Greg presented to all the coaches that he’d bought this and I said: ‘Well, I’d like to take it one step further and I want to get the GPS chip,’” Sanchez said. After financial negotiations between Boivin and the coaching staff, funds were cleared to buy ten chips. For Frederique Labelle, a masters student in exercise science and the assistant coach in charge of the project, the new technology is a benefit for players who played as well as the ones who remained on the bench. Having played with the team last season, Labelle has a unique position towards using the team’s new setup with former teammates. Having only used the technology in preseason training, three exhibition games and Saturday’s season opener against the McGill Martlets, the product is still brand new for the coaching staff. Despite not analyzing the data yet, Sanchez and Labelle have begun formulating their plan. For Sanchez and Boivin, the technology creates a professional enviroment for players. Knowing that they are the only team in the department to have such a thing makes them take it more seriously. It also gives Sanchez and his staff a new way of giving feedback to his team. They don’t always have to rely on opinion-based judgment when debriefing a player’s performance. “She was wearing a Polar watch and she mentioned that every Wednesday in her training period she has to connect her watch to a computer to the central server of her weekly training,” said Sanchez. kilometres regularly, instead of having players email him every time, he would log in to a website and see his players’ progression. hockey and basketball programs but he will not force them to do it.